Apartment is on the ground floor in a block off Dalry road. Kitchen has oven, hob, microwave, dishwasher, kettle, toaster, fridge. Guests have sole access to bedroom, lounge/kitchen, bathroom. TV in lounge, wireless wifi. After handing over keys, guests will have the apartment to themselves. Apartment has a park out the front of the building, and is close to scenic river walk. 20 minute walk to Princes street. Bus stop nearby, 1 minute walk. 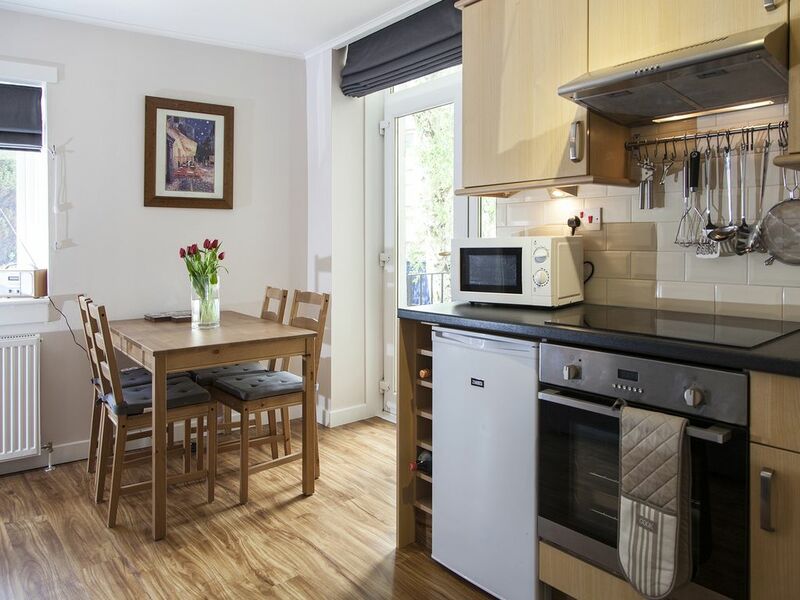 7 miles from airport, 10 minutes walk from tram stop at Haymarket. A small space outside with a table and chairs for 2. Excellent apartment for the festival! Apartment was perfect. Spotlessly clean, great location, perfect space and well equipped. Couldn't have asked for a better rental. Thanks! Stayed at this flat for a week during the Fringe and it was a little oasis for us and a pleasure to open the door to at the end of a busy day. Bob answered any queries quickly and was very flexible. The bed and bedding are good quality and super comfy, the tidy little kitchen has everything I needed to make a meal, the little bathroom is clean and contemporary. A lot of thought has gone into what the guests might need, hairdryer, iron, fresh coffee pot, it's all there. Great size good quality TV and good wifi. A nice touch was leaving more than ample toilet rolls for our stay, so many places leave just the one, and stacks of clean towels if you need them was lovely. It is a light, bright well thought out flat that we would definately recommend. Don't hesitate!! My family and I had and amazing experience here! Our host provided us an info. box with brochures about places to eat and places to visit. The amenities really made this place 5 stars. Detergent, dish washer soap, some food, cooking supplies, etc were all provided, and our host was easily reachable. The location is pretty great, as there are bus stations that can take you everywhere around Edinburgh. It is near Haymarket station, making transportation easily accessible. The property is clean and safe, with a comfortable bed. Apartment was ideally situated for our needs. Although near a main road was quiet clean well equipped and fully functional. Would definitely stay again and recommend to family and friends. Property was clean and very well equipped and maintained.. Bob even helped us resolve our computer issues. Would recommend this and would stay here again. The walk into city centre takes 25 minutes. The nearest bus stop is 1 minute from the apartment. The nearest tram stop is 10 minutes walk from the apartment.